Saints hopes of surviving the drop were given a boost this afternoon at Clarence Park as United, metaphorically speaking, failed to turn up for the first time in ages. Garry Haylock was forced to make one change to his starting XI as Alessio De Angelis had picked up an injury Saturday leaving third choice keeper Adam Thomson to take over between the sticks. Returning to action with a place on the bench was Josh Scott who had missed the last few games through a training ground injury. This is probably going to be the shortest report of the season as so little goalmouth action occurred. An early run into the United area by Paul Hakim saw the striker loose his footing at the the vital moment and the ball rolled away into touch and then the same player reached a Scott Cousins cross but Thomson gathered easily. 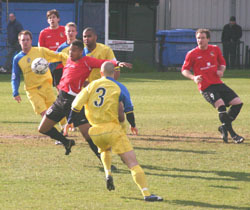 On 15 minutes the United goal was breached, Steve Perkins headed a corner out to the edge of the area where it was returned by Ben Martin and Wasiu Sunday applied the final touch that beat Thomson into the far corner. United's only real chance of the whole first half came five minutes after going behind when a Liam Collins corner was flicked on by Perkins to Nevin Saroya who having brought the ball under control was denied by a combination of Ben Martin and veteran keeper Paul Bastock. All that happened for the rest of the half was Saroya toed a long range Paul Bruce effort wide and on the stroke of half time a Bruce free-kick was met by Sunday but his header was well wide. Sadly the second period was to be no better, the only difference being that as well as conceding United also ended up with ten men as Steve Perkins saw red for a professional foul. With almost an hour played it was United substitute Josh Scott who went close when getting his head to a Liam Collins cross but the ball went wide of the far post. Five minutes later a long punt forwards by Bastock saw former United striker Simon Martin receive a neat chip from Lee Clarke but his lob cleared Thomson and the United goal. 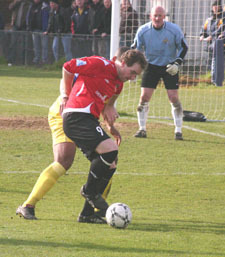 Twenty minutes of the game remained when both Perkins and Saroya in quick succession made sliding tackles on the edge of the area to deny the home side from firing at Thomson, the third tackle did however give rise to a free-kick that Bruce curled over the wall and inches wide of the target. 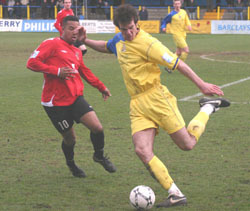 Three minutes later and the game was all over as a contest, Simon Martin broke away towards goal only to be dragged back by the shirt and having awarded a free-kick just outside the area, referee Mr Burt had no option but to show Perkins a red card. The misery was then doubled as Bruce stepped up and curled an unstoppable shot into the top corner to double Saints advantage. In the 90th minute, United finally gave Bastock a chance to earn his salary. 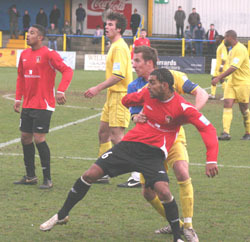 Having been awarded a free-kick 25 yards from goal, Saroya curled the ball over the defensive wall but Bastock was quick enough to touch the ball over the bar.